Many people have asked what led me to start RxTrace in the first place? In fact, there were three people who contributed to that decision. First, my youngest daughter, Jane, had written a blog while she was a student teacher of English in Japan during the 2006-2007 school year (see “Rodgers-sensei”). Obviously, since this was her first extended period living so far away from us, my wife and I followed her blog closely. It turns out, she is a pretty good writer (she now works as a technical writer for a major bio-tech company) and we were captivated. The second impetus that led to RxTrace was my discovery of Adam Fein’s Drug Channels blog. Dr. Fein started his blog in May of 2006 and I discovered it sometime in early 2007, I think. Dr. Fein wrote about things in the U.S. pharmaceutical supply chain and I was working at Cardinal Health at the time. Most of what he wrote about I did not understand, but I learned a lot by reading every posting. And when Dr. Fein wrote about the Florida and California pedigree laws, I ate it up. I loved hearing his opinions about the regulations, the regulators and the industry’s probable approach to dealing with those regulations. Dr. Fein’s writing has always been captivating. I am still an devoted subscriber. I also learned about the mechanics of blogging from Dr. Fein. He explained how he had started and recommended a few tools, but I was still hesitant since I worked for Cardinal Health. But all hesitancy ended when I found that Tim Marsh, then with Pfizer (now Managing Director at Supply Chain Security Partners), had begun an industry blog. Tim and I had met several years before while working on an early industry RFID pilot, and since we both worked for mega-corporations, I thought, “if he can do it, why can’t I?”. Tim’s original blog is now long gone (perhaps the “mega-corporation” he worked for didn’t like it? ), but it must have been in early 2009 that he had posted three or four essays dealing with anti-counterfeiting of drugs and anti-counterfeiting technologies. That’s all it took. I bought the domain name “RxTrace.com” for $15, created a Blogger.com account for free, and posted my first essay over the Independence Day holiday in 2009 (see “Welcome to rxTrace”). During the first year or so I spent a lot of spare time improving the site, moving it off of Blogger.com to my own domain, creating the iconic RxTrace logo, registering the name as a Trademark, setting up a subscription service with Feedburner, then moving it to FeedBlitz, and then beefing up the hosted infrastructure as readership continued to go up. In fact, the hosted infrastructure has been expanded multiple times of the six year history, thanks to the ever increasing readership around the world. This year I started to offer new RxTrace essays in English, Portuguese, German and Spanish. I would like to add more languages in the future but I will hold off for now until these first three catch on better. So far the pageviews are very low for those added languages. I have also been asked to explain the use of Led Zeppelin’s album covers for my anniversary essays. When I was in high school I was in a rock band and my favorite music was created by Led Zeppelin. They are still one of my favorites. So when I needed an image for my second anniversary RxTrace essay (I only started to attach a graphical image to essays in my second year of writing), I decided to use the album cover for Led Zeppelin II (see “RxTrace: Sophomore Effort”), and I would use successive Led Zeppelin album covers each year. 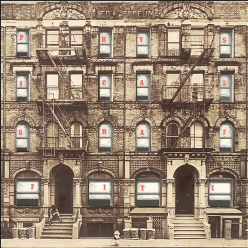 This year is “Physical Graffiti“, their sixth album. That leaves only three more studio album covers available! Will RxTrace last another three years to see the use of those album cover images? I’m still not sure. Since my “Future of RxTrace” essay in April I have secured a contract that carries me at least through September. I will continue to write as long as I am allowed, and I will try to always take the path that leads to that allowance, if I can, but RxTrace does not generate enough income to live from and so I may be forced to end it at some point in the future. Until then, thanks so much for reading! The second half of 2015 should be very interesting, and 2016 and 2017 should be downright riveting! So stay with me. So, RxTrace is your Shangri-La beneath the summer moon? Thanks for the shout-out, Dirk. Look forward to reading much more from you. Before you know it, it will be ten years gone! Congrats on 6 years! I learn so much from reading your posts. Wishing you unlimited future success, and keep on blogging! Dirk, how about Crowd Funding or donations or subscription fees of some kind to help offset your income? I’m not aware of your total readership (I’m sure it is larger that I think) but there is a portion (probably larger than you think) that would be OK with spending some amount that provides a lot of really good information, without the sales pressure. Its a thought. Your insightful information will be missed by all of us! RxTrace has been a great resource, Dirk. Thanks for your efforts and openness in sharing info, thoughts and opinions. Keep up the good work! The industry and all stakeholders benefit from your efforts.